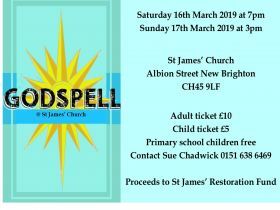 The musical Godspell will be performed in St James' church on Saturday, March 16 (at 7 pm) and Sunday, March 17 (at 3 pm). The cast includes church members and friends, pupils and with the member of staff, Mr. Brock from New Brighton Primary School and professional soloists. Get your ticket now, to avoid disappointment! Tickets are £10 for adults, £5 for children (but Primary School pupils can come free). See any member of the St James' inSpire team, for tickets. Godspell is a wonderful inspiring musical, suitable for all ages. The performances are being masterminded by actress Sue Hodge - best known for playing Mimi in the hit sitcom 'Allo 'Allo. Sue will also be performing in our productions. This is one event not to be missed!